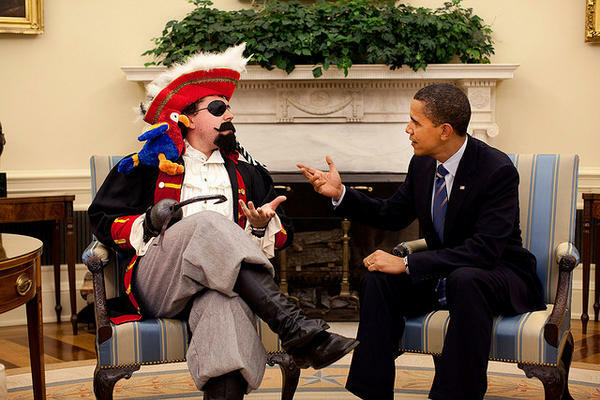 President Barack Obama, above, negotiating terms of surrender. Har har. While Obama tweeted the photo above, Americans were under attack around the world. Laughter is a good thing, even at the worst of times–yet Obama has made a habit of self-indulgent frivolity in grave circumstances. There are, to be sure, some links between Islamic terrorists and pirates. Obviously, that’s not what’s being discussed here. If anti-American mobs raised the Jolly Roger instead of the Al Qaeda flag above U.S. embassies, perhaps Obama would pay more attention? Tammy Bruce is running a caption contest, which is perhaps the most coherent response to Obama’s foolishness–which could not persist if the mainstream media did not let him get away with it. Time Obama walked the plank, in November.